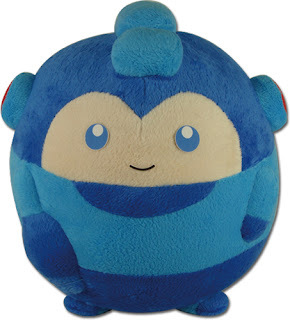 Earlier this year the folks at Great Eastern Entertainment blessed this earth with a smug-as-hell plush Proto Man ball. Today they're throwing one more into the mix: Mega Man himself. It's so dumb it's cute. This little guy just popped up on GEE's product page labeled "coming soon." GEE's Mega Man goods can typically be bought both online and in-store. Be on the lookout! Looks like unemployment has hit Mega Man pretty hard. Mega Man has become the Mega Ball. what dimensions are theses plushies? You're good enough, you're smart enough, and doggone it, people like you! Now I'm just waiting for the Servbot version, at which point I'll just die of cuteness overload. This is inching me close as-is.